As greens are still being harvested by the bunches I’m always looking for a new way to serve them as the CSA is filling my fridge to overflowing with greens, greens and more greens! Even my salad lover, Tonchi, made the comment this last week “Salad again? !” And that is a rarety for him. He will often take seconds on salad over a hot dog or sausage or other scrumptious foods! He LOVES his greens! I’m so glad we’ve been forced to eat them! I love them, but I don’t buy them or serve them enough. Since they are delivered with the CSA and I HATE to throw anything out! I try my hardest to not let them go to waste! And so far, so good! We’ve been able to keep up… barely! 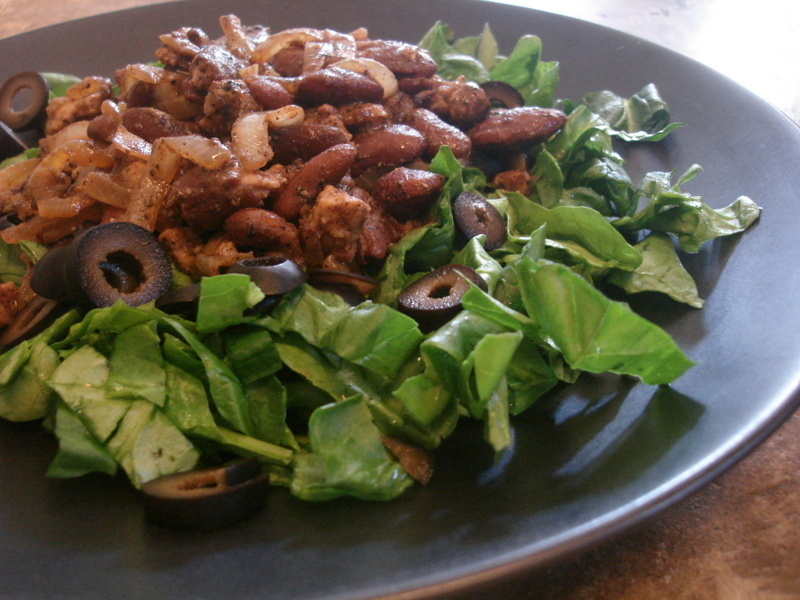 I had a warm spinach salad a few years ago that was absolutely delicious and I can’t seem to find the recipe. I know I wouldn’t have thrown it out since it was a hit from day #1!, but alas… it is no where to be found… maybe in my purging I’ve lighted my load a bit much! No worries! Even though I can’t find it, I remember enough of the idea to come up with my own version. So here it is! This was a huge hit and leftovers are just as good! Chop spinach into bite sized pieces and divide onto plates to be served. Slice black olives and divide between plates. Add dried beans in a pan of water and cook until soft- preferably soak overnight before cooking. Add chicken stock while cooking. Chop pork chop into small pieces and saute in another pan separate from the beans in bacon grease or lard until well browned with crispy edges. 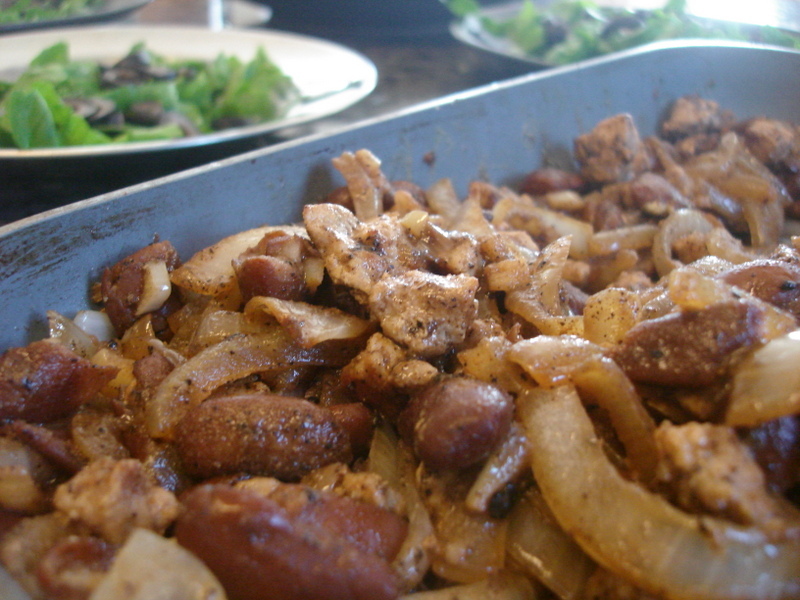 Once onions are translucent and the garlic soft add in pork and beans. Mix in mustard and vinegar and heat until all is warm. Add mixture on top of spinach and serve. This is literally making my mouth water just thinking about it! The sweet of the pork and the salt of beans and the tart balsamic vinegar and mustard! I perfect combination in my book! I’d love to hear what you think after giving it a try! Oh I’m going to try this! What is brown mustard?